You should check out my other blog, the one I’m actually writing in. Here’s the link! Well my dears, I have decided to move on over to join the lovely folks at wordpress for this next batch of blogging adventures. As much as I loved my time with posterous, it became clear to me that many of you were a wee bit confused by it, so here I am in a more well known and main-stream location. I will move all the Mali posts over in the next week or so and then begin sharing the details on my next adventure! Until then, however, happy summer! 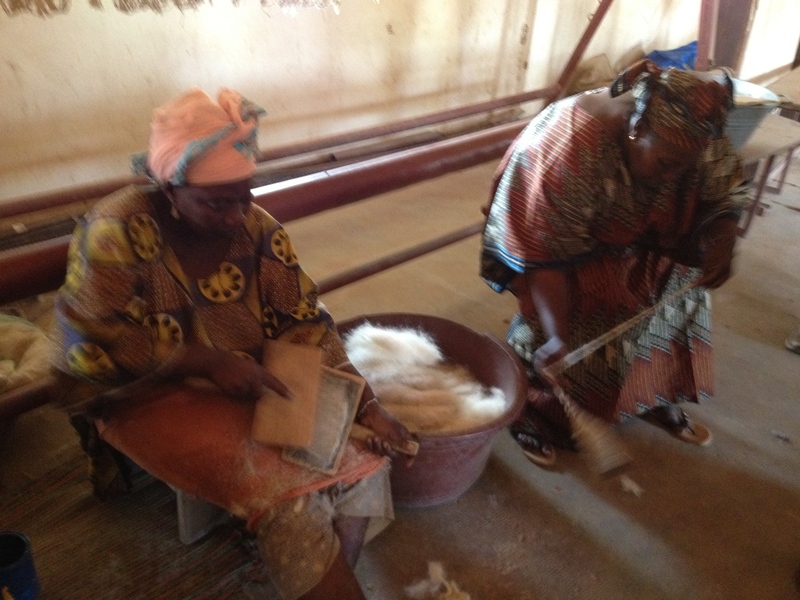 We arrived in Djenné around 8. 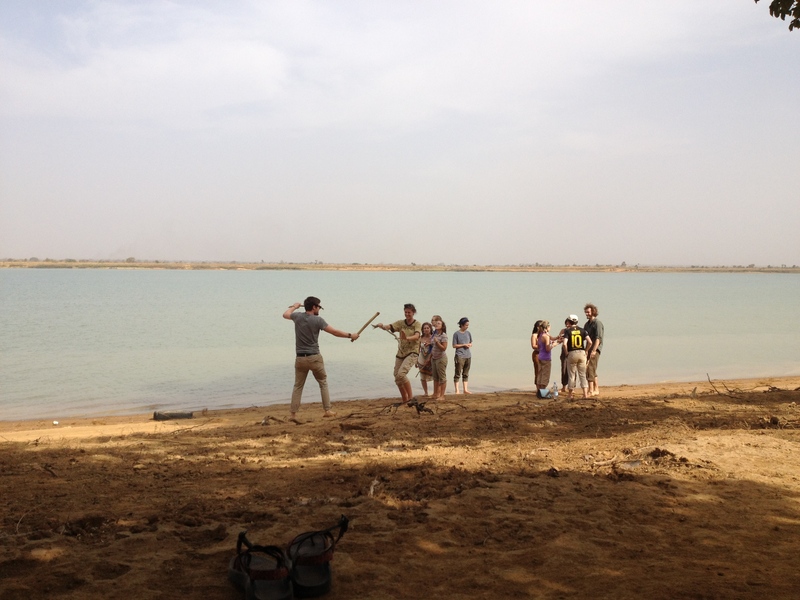 Djenné is, in a way an island, and we had to cross a ferry to get there. As with Pays Dogon, our cars were mobbed by street vendors trying to sell various necklaces, bracelets, and souvenirs. 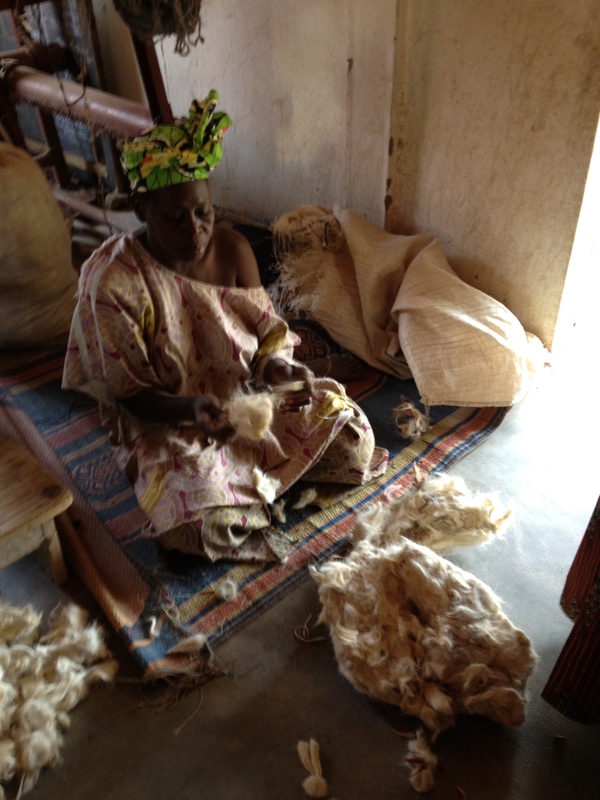 By the time we got to Djenné, however it was getting dark, so we gratefully retreated to our rooms in our hotel. The rooms were all very nice, and after we were happily settled we went downstairs for dinner. I was starving and loved our meal. We also got papaya for dessert, a fruit that I’m quickly falling in love with. They also offered tea and coffee to us, so I helped myself to some of the lovely peppermint tea they were brewing. After dinner a few of us asked permission to leave the hotel and buy some phone credit. Once we’d left, however, we didn’t want to immediately return, and ended up wandering around a bit. 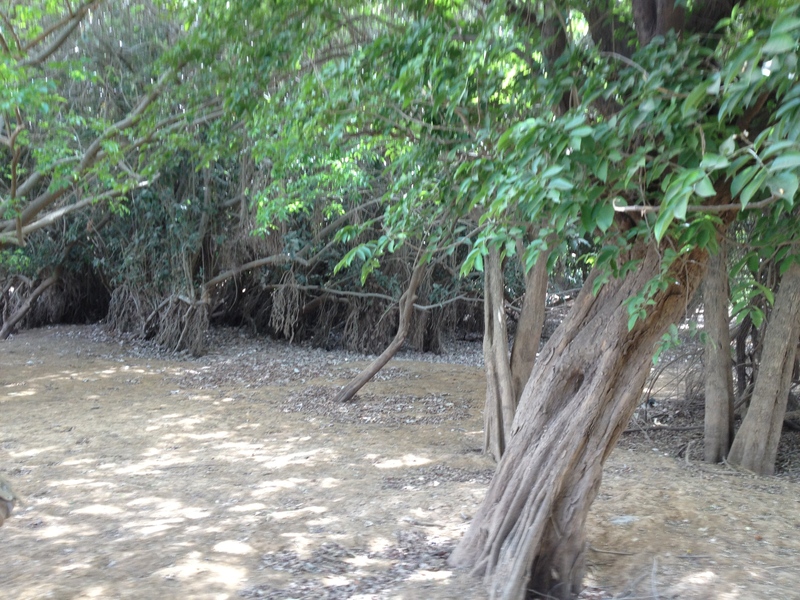 As we meandered through the streets we came to a large clearing and discovered we were right in front of the mosque. 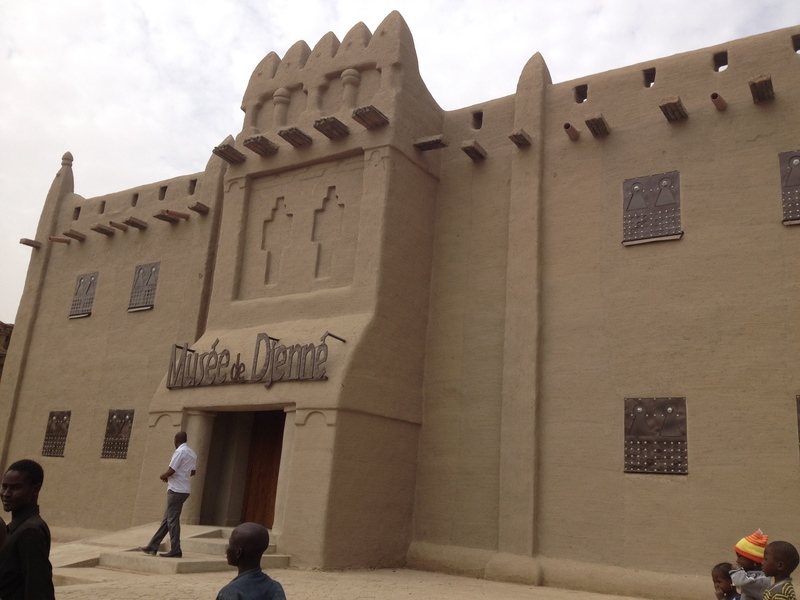 Djenné’s mosque is fabulous – the city’s main tourist attraction. 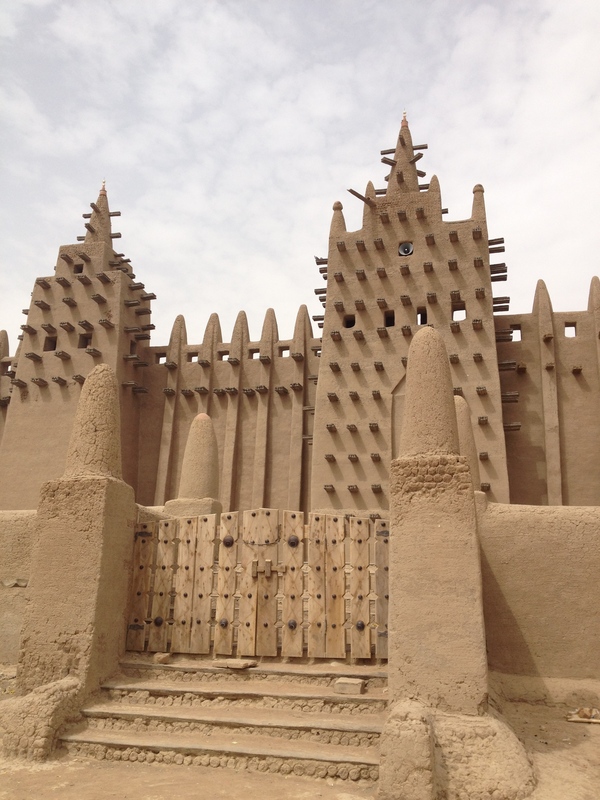 It was originally built in the 13th century (making it one of the oldest mosques in Mali), but it was expanded/reconstructed in 1907. It is the largest adobe structure in the world, and has to be re-mudded every year before the rainy season so that it doesn’t fall apart. The sun does a number on it through the year as well – by the time they re-mud it, it’s usually covered in cracks. The entire town helps rebuild their mosque, spending a couple days mixing and placing the adobe. Seeing this mosque that night – under the stars was incredible. Djenné has been named a world heritage site, so most of the other buildings are adobe as well, and the city’s modernization is pretty limited (obviously causing some big problems), so the stars were really clear and the city streets were very quiet. I’ve seen a lot of religious buildings in my time, but this one was incredibly moving. Beautiful, ancient, and powerful. I couldn’t get enough of it. The fact too, that the entire city’s hands go into it, gave it another special dimension. It was incredible to sit on its steps, touch its walls, look up at the tiny ostrich eggs placed on its minarets against the sky. I loved it, and didn’t want to leave. Even though we can’t enter it, it was still wonderful to see it. And, honestly; I’m not sure I’d want to enter it. I loved seeing it, forming my relationship with it outside its walls, and I like the fact that the interior is reserved for the faithful. I think that makes it all the more special. After we left the mosque, we met and spoke for a few minutes with a one of the residents. His name was Ousmane, and he had just been at the festival as well. Apparently he is the balaphone player for Baba Sissoko, one of the bigger acts at the festival. He was very kind, and before we knew it, we were whisked off to his house to have a couple rounds of tea. His “house” was tiny, just two rooms, but he made us tea, introduced us to his mother, gave us some peanuts, and every comfort we could wish for. He was so kind, and so attentive, all of us were very touched. 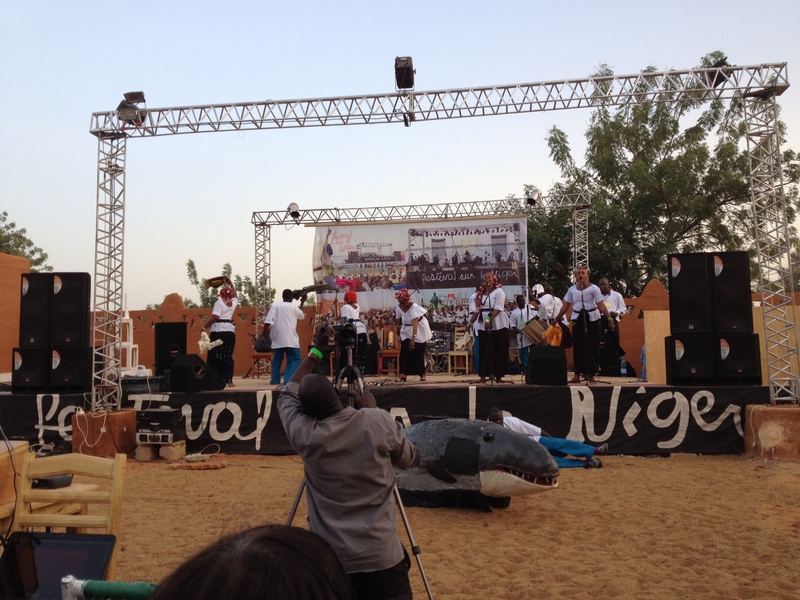 Moreover, he said he’d be in Bamako soon, and that we could go watch him rehearse with other musicians. So that’s something to look forward to. 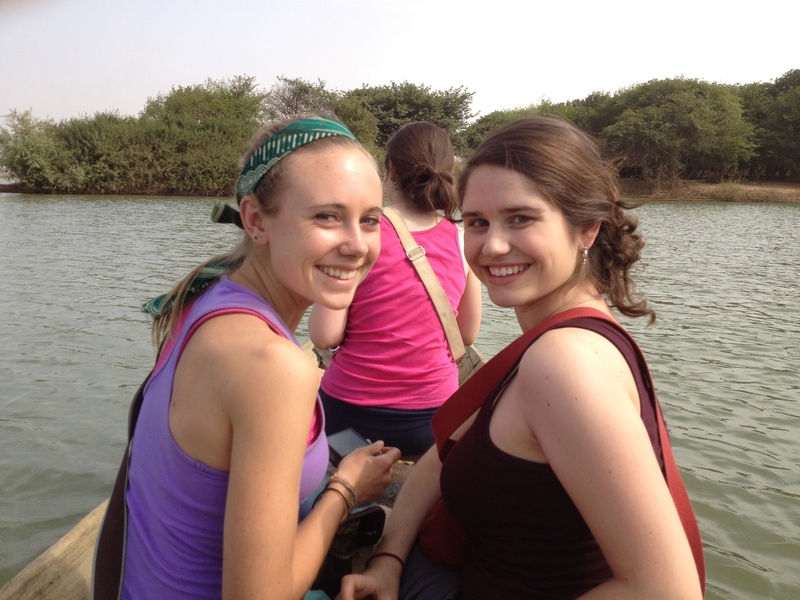 The next morning we made our rounds to the most important sites of Djenné. I am so grateful now for our night excursion, as it allowed us to see Djenné more than we would have otherwise. We basically zipped into the museum, the library, the cultural center, and stopped by the mosque for a photo before we had to hurry back into the cars and head to Burkina Faso. For me, someone who usually spends time in the places I visit, this quick touristy way of seeing the city was frustrating. I wanted to spend more time, talk to more people, and was pretty cranky when we got back in the cars. But it wore off, and before I knew it, we were across the ferry and on our way. 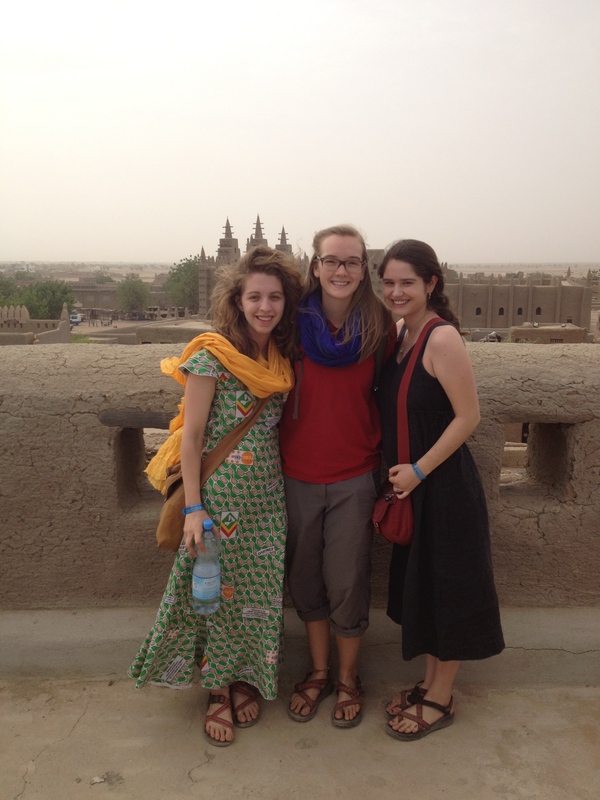 Me with my neighbors (Caley and Sara) in front of the mosque (on top of the museum). We’re known as the Baco Dicoroni ACI girls. We left Segou early on Sunday morning, and as I said, I wasn’t feeling too good about it. It’s funny how fixated I can get on places. 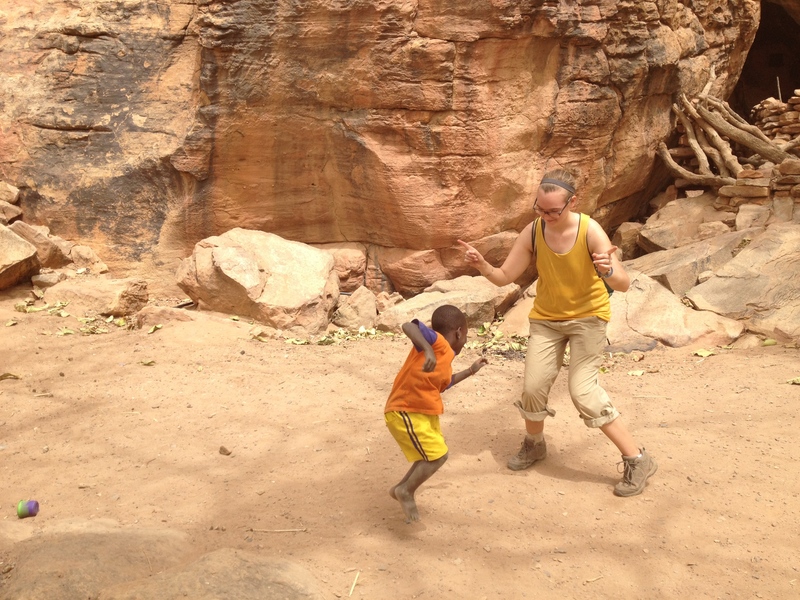 I’d been looking forward to Pays Dogon for weeks and in seconds I forgot about it as I lamented leaving Segou. The drive was long…so long. We stopped for a little picnic around 1:00 and feasted on hard boiled eggs, sardines, bread, and sodas. I’d never tried sardines, my father loves them, eats them on crackers for lunch when he can. I somehow always equated them with anchovies and refused when he offered to share. I regret that now – they were super tasty, though that could have also been because I was really really hungry. As we started out, my car had a problem. An “Oh look! Some smoky fume-y stuff is coming in through the AC unit.” moment. An “I am NOT going to die of carbon monoxide (of all things) in Mali today,” moment. We turned off the AC after that. It was a long ride, but thankfully after a while, as we got closer to Mopti, the air cooled some. The landscape was spectacular – truly rugged and absolutely beautiful. I made sure to look out the window from then on. We stopped briefly in Mopti for gas and some snacks. I didn’t realize how crazy it was at first, but our gas station was SO much like what you’d find in the States. Unusually so, equipped with a service station filled with snacks. Emilia and I snagged some juice (apple – a rarity here), some cookies and some sour cream and onion Pringles. I feel a little guilty about how much I enjoyed those – they’re one of my guilty loves in the States, and to someone who’s been munching just Malian food for months, they were heavenly. 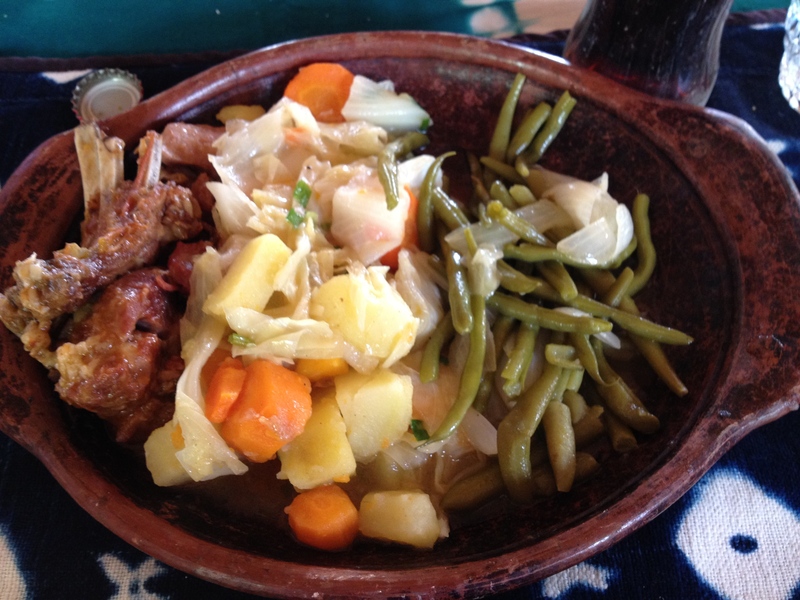 Not that Mali food isn’t marvelous – it is, but the taste of home was very welcome. It started to get dark after that, and then we turned off the paved road onto a rocky path up the cliff. It looked – in all honesty like the start of a horror movie. Oddly shaped trees and rocks, abandoned motos on the side of the road, men walking alone on the path, little lights in the distance. I loved it, craned my neck to check out the architecture in the towns we drove through. Then I realized, if that was the commencement of a horror flick, I’d be the first to die. I’d be that girl, the one who’s running around, looking at everything and chatting excitedly until I suffered some mysterious and horrible death. I’d be the warning to all others – leave the stuff alone, lock your doors, stick together, and pray you survive. It’s always good to have moments of self-discovery. The route got worse as we continued, and as it got worse, our car sounded worse. It sounded horrible, in fact. Like it was going to keel over and die any second. And finally, as we tried to maneuver, the sand caught us. We were totally stuck, couldn’t move forwards or backwards. We weren’t as bad as Cherif’s car though, a few meters away, it was up to its bumper in sand. We had to get out, stand and watch as the chauffeurs tried to push it out. I didn’t know whether to laugh or cry – it was close to 11:00, I hadn’t had dinner, and our cars were stuck in the desert. In the end we were transported to the hotel in a working car. The chauffeur drove like a madman – fast, crazy. I now think I know what it feels like to be in a car chase scene in a movie. But we made it okay, ate dinner, and by the time we were finished they had miraculously freed the two cars and all was well. The next day, we took a hike to the top of the cliffs and down the other side. It was beautiful, magical. We got to visit 3 different villages, see the countryside, view the dwellings in the cliff sides up close. I was totally exhausted by the end, but I loved every second of it. Well, save the last few. 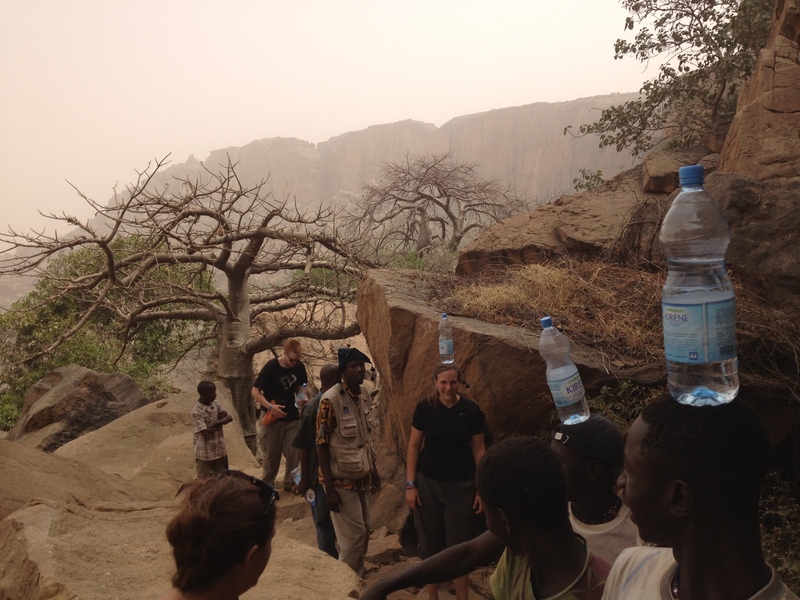 We had been told that some guys would help us carry our water and help us with the more technical parts of the climb. I was reluctant to hand over my water. As a former big hiker/backpacker, I have a certain pride about carrying all my stuff myself. But there was a moment when I needed both my hands, and one of them took my water bottle, and only gave it back so I could drink, before reclaiming it. It was, in a guilty way, kind of nice. And he was sweet, offering me his hand when the going was tricky, carrying my bottle on his head to make me laugh. Anyway, most people had similar experiences, and for those who haven’t climbed/hiked much, these guys were saviors. At the bottom, however, things got ugly. We had been told that Cherif would pay for their services, but these guys didn’t wait long before they began to demand money from all of us. Some acquiesced, handed over 2000 francs or so, others had to endure the angry glares of their unpaid guides. Mine, thankfully, did NOT ask for cash and I escaped into a car pretty fast, but it was stressful for everyone else, and not a good final note for the hike. Caley playing with a young boy who joined us on the hike. After a quick lunch, and a nice nap, we headed down to visit a local sculptor. His work reminded me a lot of Dolo’s and I chatted with him for a while about his practice, what materials he used, what exhibitions were like, etc. It was really cool for me, and he was very nice, so I really enjoyed our afternoon and stayed at his shop for a couple hours. We packed everything up the next morning and, after breakfast, settled ourselves in the cars. We stopped briefly at a small town where some people bought some thing’s before we left. These towns make me sad. 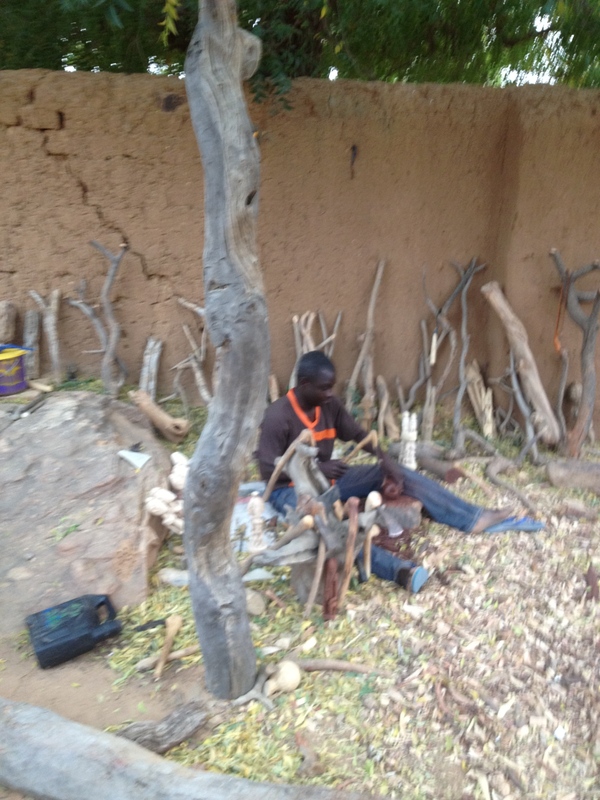 Cherif told us that over the years, these towns have become accustomed to tourism, that their hotels are full to bursting and many people began to make their livelihoods on selling souvenirs to tourists. Now, with the problems in the North and the swiftly advancing desert, people hardly ever visit, and these vendors grow desperate. For me, this produced a constant mix of emotions – I was irked at being bugged, pressured constantly to buy some small idol or necklace but I also understood, and felt sad for these poor people who are going to have to rethink their lives if all this continues. Apparently the sand was never as bad as this year – some cars briefly got stuck, but it was never a big deal. Not the case for us. Even though we took a different route leaving, two cars got seriously stuck, and needed serious work to get moving again. Guess which two? Cherif’s and…you guessed it, mine! I think Emilia and I were cursed on this trip – we even chose a different car, but we still got stuck. It was pretty ridiculous. So, anyways, Rick Perry, I think climate change is really a thing, you know, now that I’ve actually seen PROOF of the advancing desert, I think it’s a pretty safe bet. 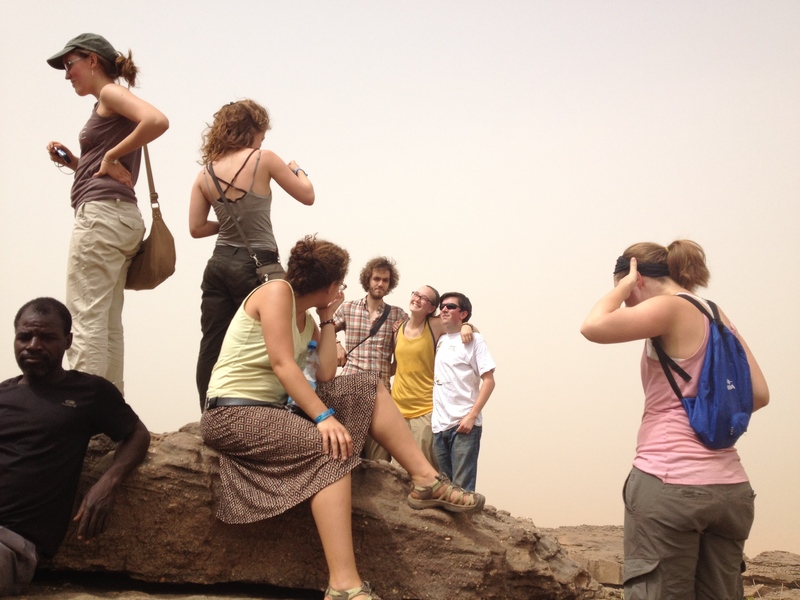 We stopped at two more towns before quitting Pays Dogon. 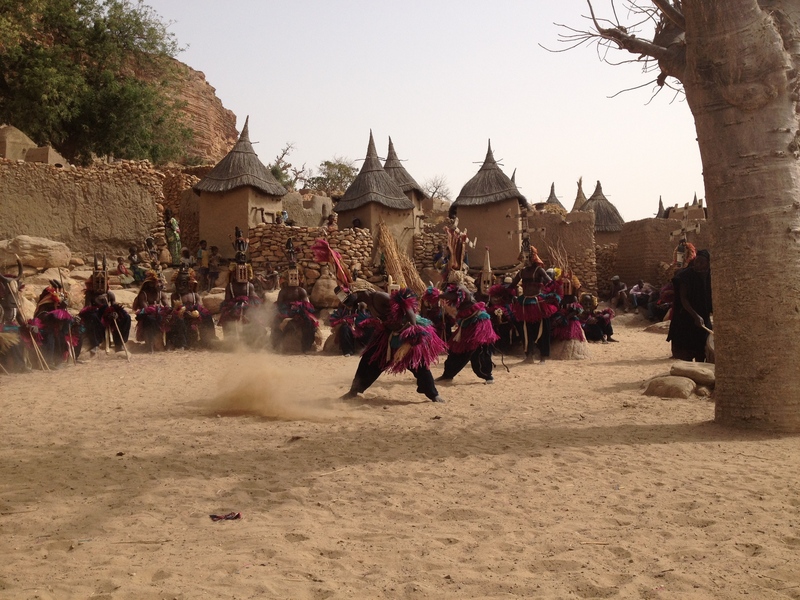 The first, was a small village where we watched a Dama, or Dogon masquerade. Now, I’ve had mixed feelings about this for a while. 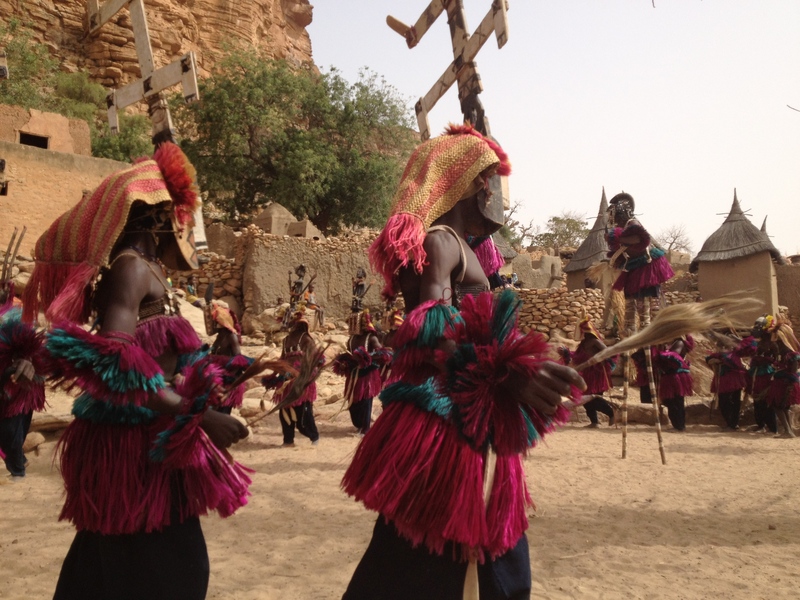 On the one hand, the Dogon are known and celebrated for the Dama, it’s spectacular – one of the oldest and best preserved traditions in the world. On the other, however, is the fact that this dance was NEVER supposed to be seen by Western viewers. Tourism has changed all of that. It’s kind of sad, one of their most sacred traditions has become an act for curious Western viewers. Part of me wanted to refuse to watch it, on principle, out of respect for what this was. Another part of me, however, wanted to see it – to experience this marvelous show, cited as performance art now in African Art textbooks. I wanted to see them move, to see one of the most memorable things I studied last term. Of course I did see it, and of course it was incredible. These men are amazing, the way they move, with those heavy masks blows my mind. The Dama is, truly, something you will never fully understand until you see it – and even then you won’t really get most of it. It was incredible though, even with the twinge of guilt I felt, the anger at all the Westerners who stole this tradition. 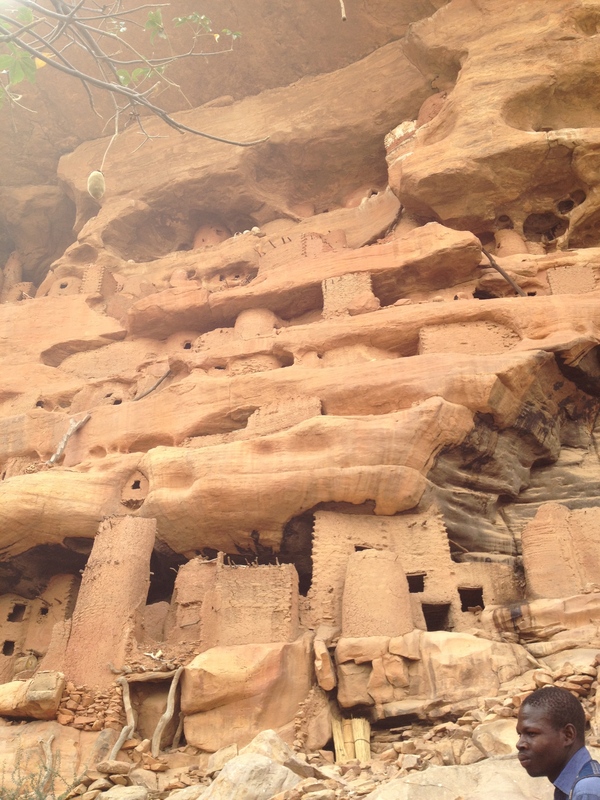 Our last stop was Bandiagara – a larger city, where we lunched at a very nice hotel. It was filled with toubabous which, as always, was kind of weird, but we got a marvelous meal and I saw a parrot (!) amongst the foliage. So that was cool. All in all, Pays Dogon was interesting, mystifying, and made me feel very conflicted. It raised a lot of really interesting questions for me, questions that I will undoubtedly ponder for a very long time. And for that, I am very grateful. After a very yummy lunch at the hotel, we met a Carleton alum who was visiting the festival. He’s now an ethnomusicology professor and told us a little about his experience as an undergrad and after. He also plays the kora, and runs an ensemble at his university. I got his contact info, and now, thankfully have a resource back in the States. Next, we headed out to see some of the afternoon’s performances. We two different women sing, and both were phenomenal, one’s music typically accompanied performances using huge puppets of fish, and the crowd loved it when they appeared during her performance. They were enormous, operated by men on the inside and the “swam” around in front of the stage for a bit. We hurried back to the hotel for a quick dinner and to clean up before the evening’s festivities. 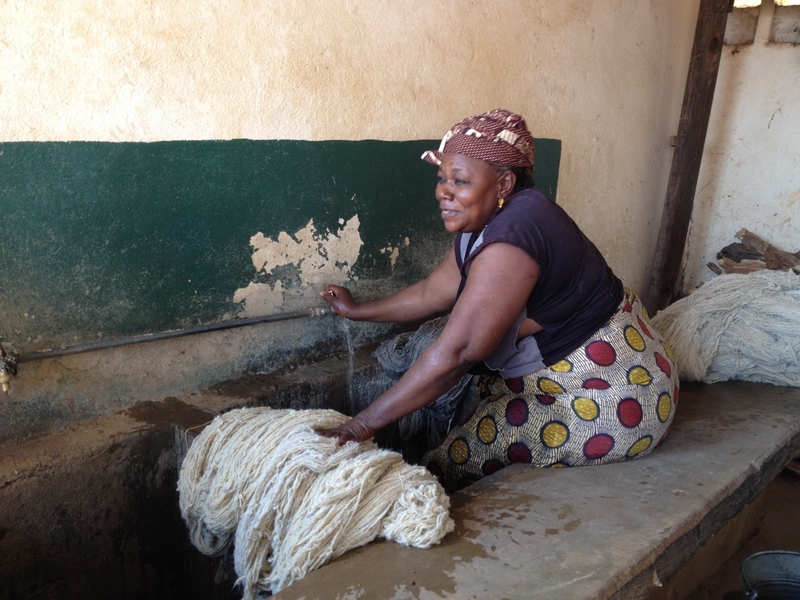 Cherif was feeling sick, so he and some students who felt tired ended up staying home. The concert was packed with people, and getting a spot near the stage was challenging. We fought our way through though, and were able to enjoy the music from a relatively close distance. I ended up retreating to further up, and watched the performance on one of the many screens projecting it after a while, as some Tuaregs were flirting with me, a real creeper was getting in my space, and I just felt kinda claustrophobic. I ended up running into the calabasse player again though, and we talked for a while, which was fun. We didn’t end up going home till 2am, and once we got there Somaila surprised me by saying “Discotheque?” So, after dropping some things off in our rooms, we hurried out again to another venue where a dj would be playing music till 6. Of course, they hadn’t started yet when we got there, so we heard another group play for a while before we started dancing. Once we did start though, we had so much fun. We were joined by some of Somaila’s friends – two girls who were working for the festival, and I had a blast dancing with one of them. She taught me a ton of new moves and laughed at me when I didn’t get them right. It was really fun, and I think all of us appreciated doing something a little crazy. We slept in late the next morning, as those if us who went dancing stayed out till 5. Our day was mainly spent relaxing at the hotel, though we also watched part of a documentary on the Dogon country (our next destination). It was really interesting, but unfortunately the sound was terrible so it was difficult to understand. We next visited (briefly) the bogolan artisans, and all of us purchased a few more things for our friends and families at home. Then we washed up, and ate a delicious dinner of fish and veggies and cake (!) – it was Molly’s birthday – before piling in the car for the concert. If I said the concert was packed Friday night, it was nothing compared to Saturday. We made sure everyone had phones before splitting up to explore/find spots. The place was packed. 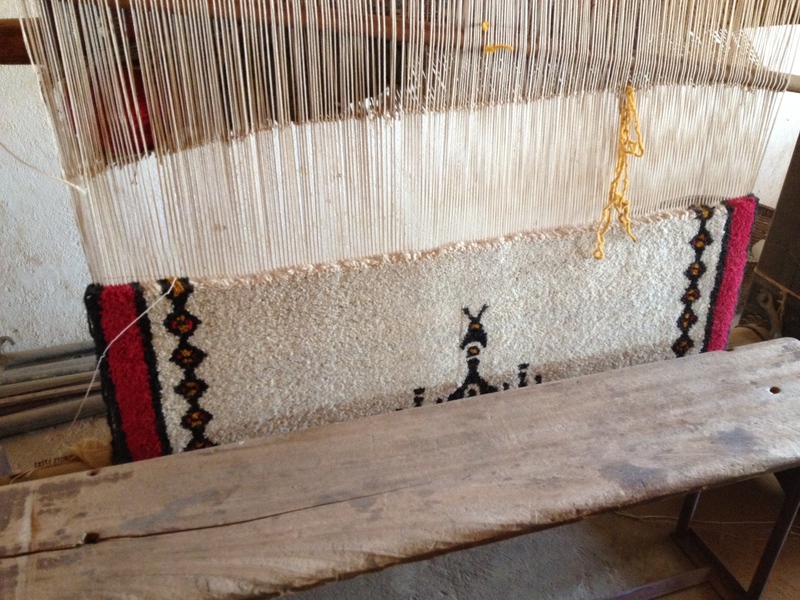 Also – I forgot to mention this earlier, but we saw more toubabous than we’d seen in the entire trip – combined. I’m pretty sure all the Peace Corps volunteers took the week off to come here. It was really strange to see them all – especially since most were crazy drunk and acting like imbeciles. Way to represent. Salif Keita started playing at midnight. I was on the far right – near the river with a mediocre view of the stage. Unfortunately the sound was not especially good were we were, and everyone was talking, so it could be hard to hear. Everyone loved his performance, and the crowd sang along to all his songs. By the way, did I mention that we met Salif Keita? He and Cherif grew up together, and I think that Cherif is the only person in the world who can get/command him to do things. So, he asked Salif to come down and watch the film with us in Nana Kenieba, and he did it! He didn’t end up watching the film – he just hopped out of the car for a few minutes, chatted with Cherif, introduced himself and got all our names, and then went back. It was crazy cool to shake his hand, and I was kinda shell-shocked for the rest of the night. Anyways, he gave a good show, and it was very cool to see him in concert. Salif finished playing around 1:00 and people began setting up for Habib Koité, who’d be the closing act for the night. A couple of friends and I decided to try to get closer, and made our way in the crowd right in front of the stage. It was packed, hotter and sweatier, but the crowd was also energetic, the sound was much better and I had a great view of Habib playing. We actually throughout the performance pushed closer and ended up directly in front of the stage at the water’s edge (this was facilitated by the fact that a bunch of people left). The performance was superb, he was dynamic and engaging and his music was wonderful. I was transfixed the entire time and danced a ton. It was a great ending to the festival, and although (once again) I didn’t end up asleep until close to 5, it was well worth it. Leaving Segou the next morning was hard. For a number of reasons, I’ve fixed on to the city, and I was really sad to leave. After two magical nights as well as some great encounters with musicians, I was very reluctant to head out. Moreover, Oumar is always so accommodating that I don’t want to leave his beautiful hotel and wonderful person. 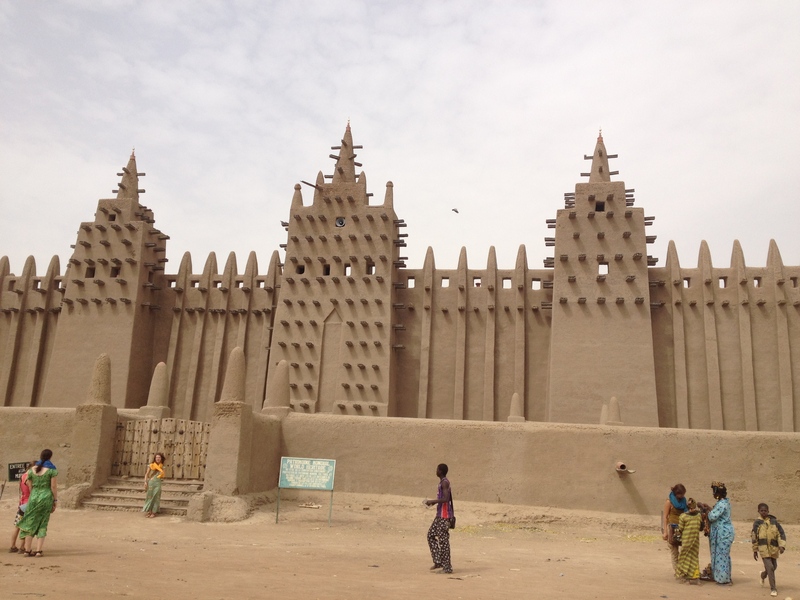 I nearly cried in the car as we drove out – this probably had more to do with my lack of sleep than anything, but I also know that when I return to Mali, I will have to come back here. We met early on Thur sday to leave for the Grand Voyage. Of course, we had a last round of classes first. All of us were together all morning for our last rounds of Bamana and French. 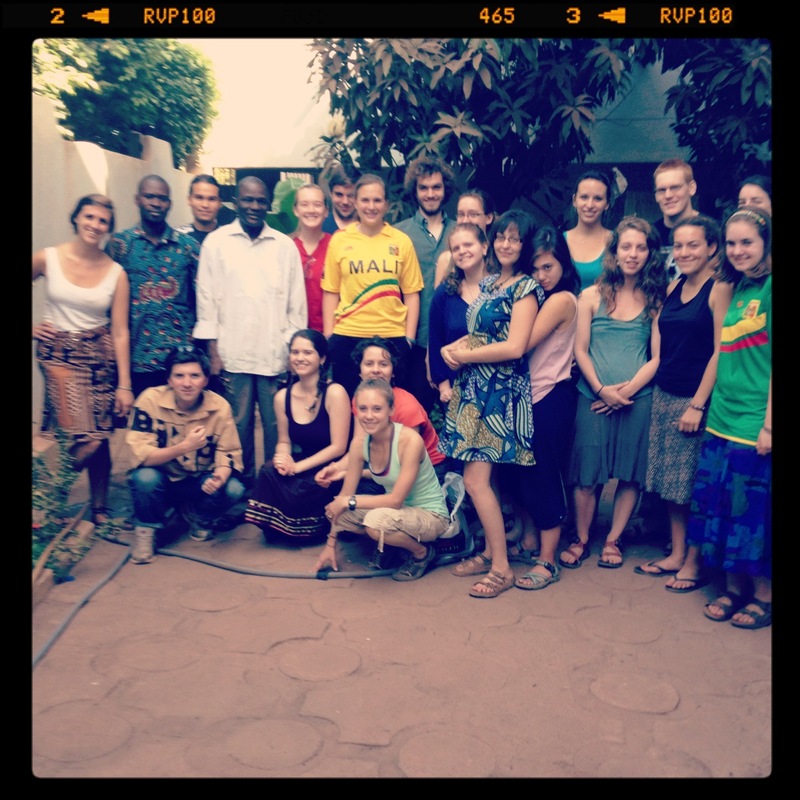 We were all especially sad to to see the last of our Bamana instructors and snapped a group photo with them before we said goodbye. After a quick lunch, we piled into the cars, counted and recounted to make sure everyone was there, checked and rechecked to make sure the air conditioning worked, and finally set out. 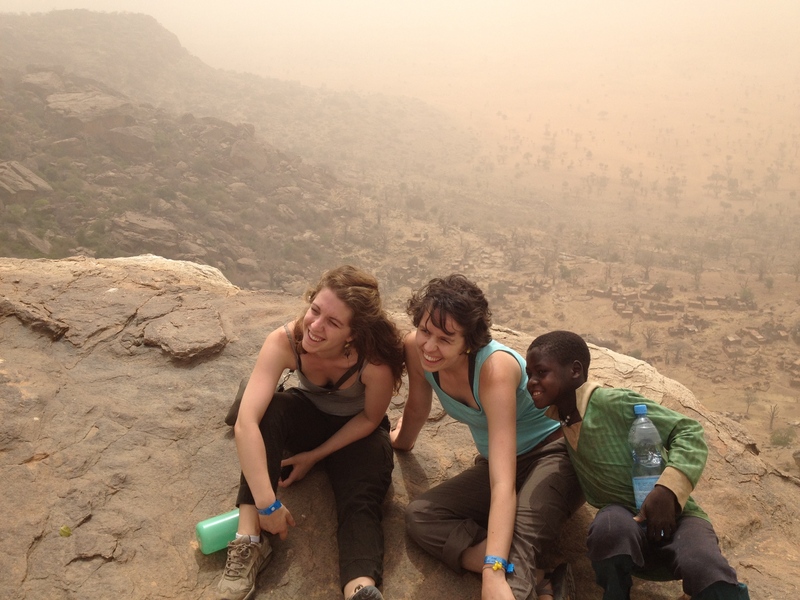 The ride to Segou was uneventful, all of us spent it chatting with our car mates and the drivers or listening to music. 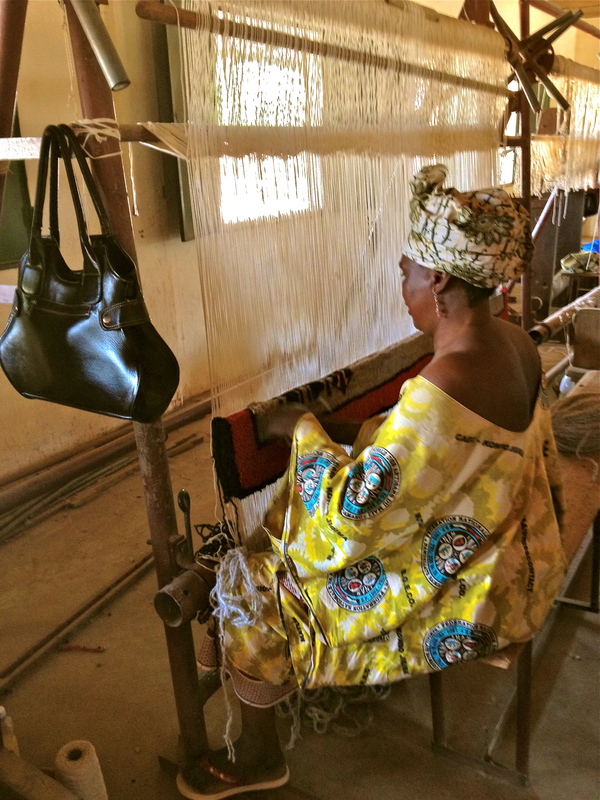 Arriving in Segou was like a homecoming. Our first visit there had been in the early stages of the program, and we were all so happy when our cars pulled up in front of Oumar’s hotel. We grabbed our bags, and hurried in, settling ourselves in our old rooms. Most of us were pretty tired, so we spent the first night at the hotel, relaxing. Several different musicians entertained us that night – the chasseur from last time, and another group run by Oumou Sangaré’s former drummer. Most of us milled about outside, listening to the music and occasionally dancing. As for me, I was wiped out, and ended up passing out early. We spent a few hours by the shore. 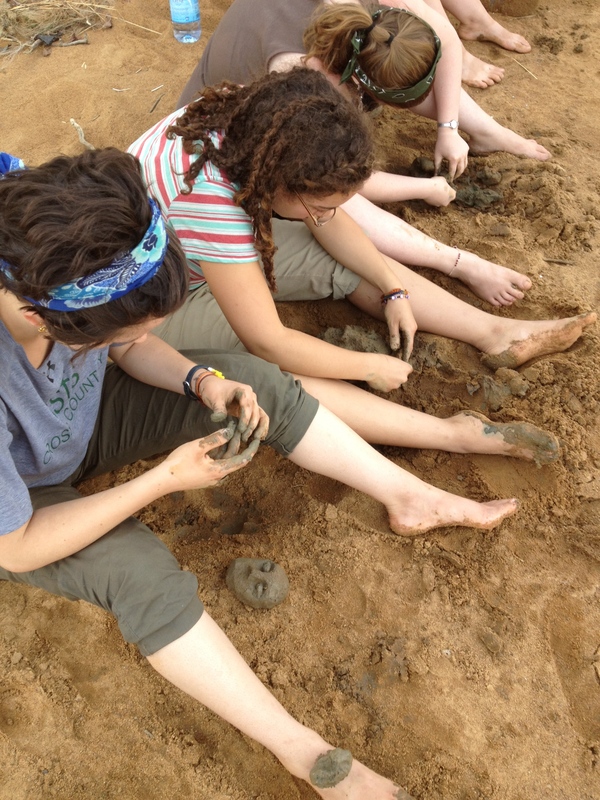 Some people discovered clay under the sand and molded it into mini sculptures. 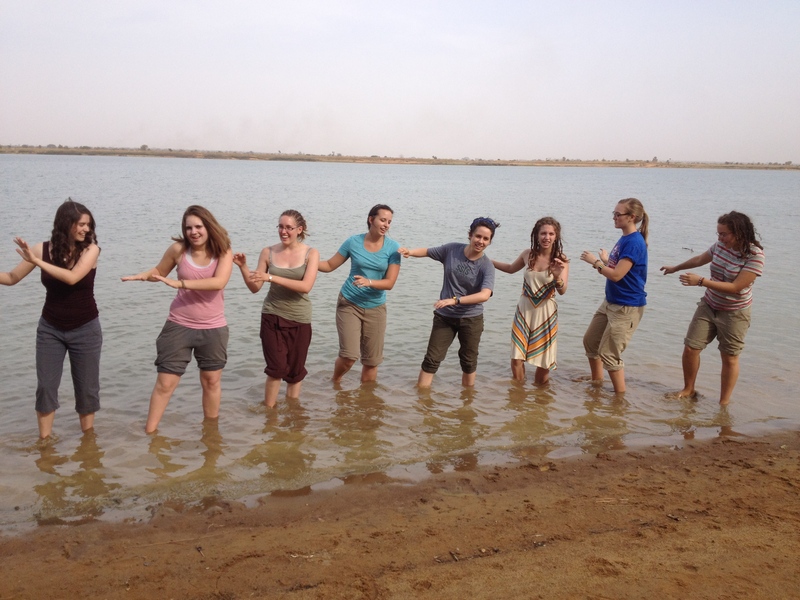 And some of us sang a Malian song and did a dance in the Niger. So much fun. The week here has been full, but pretty uneventful. We leave for the Grand Voyage tomorrow – a prospect I both look forward too, and dread. It’s a testament to my happiness here that I get so reluctant to leave Bamako, but I feel like I’ve finally found my stride. I talk to people on the street, all my haunts are full of people who know my name, and I’m comfortable with my house and family. I’ll miss them in the 10 days when I’m away. Fasirima (one of my tea buddies) reassured me that I’d be missed, and gave me a hug last night and my host mom seemed sad that I’d be gone for so long. It warmed my heart. The bad news is, I will probably not have Internet for the next 10 days and will have to try to keep up with writing posts so I don’t fall horribly behind when I get back. But you’ll forgive me if I do…won’t you? Hope your weeks are full and enjoyable!